In addition to instructing teenage dancers in Ananda Yoga (Yoga for Teens Part 1), I also had the opportunity at Langley Fine Arts School to teach a group of beginners, grades 10 & 11, from a Western Civilizations Class who were already familiar with studying different cultures, religions, and spiritual paths. Because Ananda Yoga is richly filled with deep spiritual practices that date back to ancient times, I decided to create a basic list of topics I wanted to introduce to a beginners audience. Most importantly, I wanted to be a friend to the students, even if we would never cross paths again. I also wanted to give them a gift to take home at the end of class. So I printed some colorful “Namaste” cards to hand out later. So two weeks prior to my class I began creating a layout for the age group and class setting I would be teaching in. I knew that most of the teenagers would be new to yoga, so I decided to begin with a slide presentation to give them a bit of the bigger picture (with visual aid). I’ve shared some of those slides throughout this article. Self-confidence is an important thread that I try to weave into all my yoga classes for teens. Empowering them to their highest is a great reward. So many high school girls, for example, are lacking in self-awareness and self-worth. If they can walk out of your class with a greater sense of Self you will have given them a great gift. I encourage students to feel their brilliance, their inner power (Divine Power), their connection to all life, and acknowledge their unique gifts. Help them to affirm their strength, inner beauty, etc. in any way you can. Deep relaxation is a great time to have them surrender the self-definitions and expand to embrace the fullness of their beings. As best you can, tune in deeply to your class. You will find yourself saying things you hadn’t ‘planned’. God will provide the words to help them expand. This is exactly what I needed to hear. I was nervous about making an impression on them, but she reminded me that it’s not about me at all; it’s about what I’m sharing. So this is what I planned to do—tune into my class. Swami Kriyananda, the founder of Ananda Yoga, has given thousands of lectures, and several times he’s stressed the importance of “tuning into the audience and their specific needs.“ Knowing your topic well and being prepared with a plan is obviously essential, but remaining open to the individual needs of your listeners is what matters most. 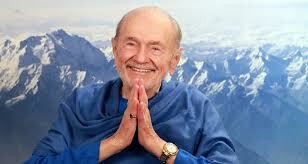 The morning soon arrived where I would be offering my class: an intro to Ananda Yoga. “What could be so hard about teaching a group of teens anyway?” I asked myself while walking to class. I was nervously reminded of my friend’s other words: “Teenagers can be one of the toughest crowds. You’ve got to get on their good side right away.” After all, she had worked with teens regularly, and I too remembered being a critical teenager. Instead of doubting myself for the duty I had voluntarily signed up for, I kept my energy high and projected joy as I walked to class. I thought of my Guru and His grace, and trusted that He would guide me to say the right things. I meditated briefly before my class to calm my mind, and release any fears or expectations. I handed the plan over to God who was watching and guiding everything. It was a cold Monday morning, first period, when it began to snow. As the students slowly arrived to class they realized they’d forgotten about doing yoga, and more than half of them were wearing jeans! “Jeans, huh?” I made some playful remarks while shaking my head. “I hope they’re real stretchy!” I said. Some of the students laughed as we made conversation. One thing I’ve learned from watching more experienced yoga teachers over the years is that they’ll almost always try to connect with their students before the class begins, especially if students are new. This way, the students can relate to the teacher as a friend instead of someone who’s “highly advanced” or “superior” to them. Being friendly creates an atmosphere for people to open, and in turn become receptive to what you have to offer. 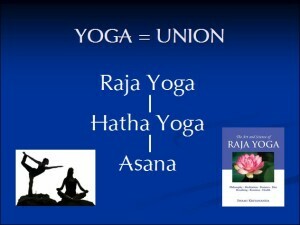 I was grateful for the extra time I was given to offer the slideshow about yoga before we got our bodies moving. 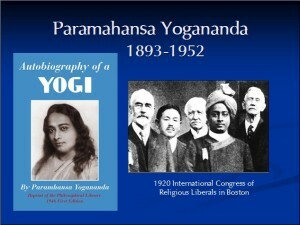 It gave me the opportunity to introduce the origins of yoga, why it is practiced, and what its benefits are. 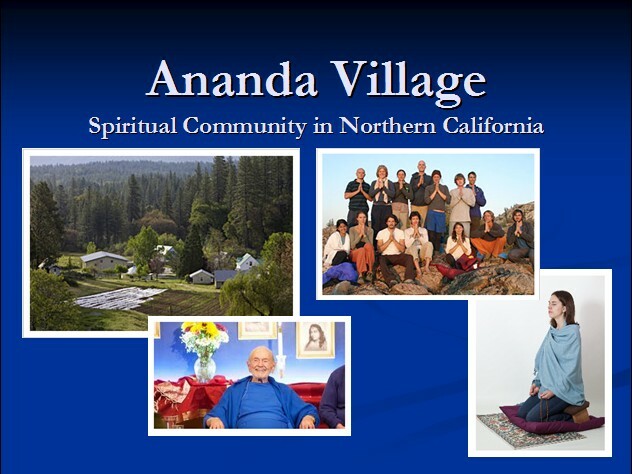 I also had the time to share a little about the spiritual community I live in today, why I chose to move to Ananda Village after high school, and why I chose to become a yoga teacher. I didn’t plan on talking about this, but I told the students that I used to party regularly in high school until yoga helped me to see the person that I wanted to be. There were some wide-eyes and smiles at this part of my story. Because I was teaching to a Western Civilizations class, it fit perfectly to mention Paramhansa Yogananda, the first yoga master from India to take up permanent residence in the West, and how he impacted Western culture in the 1920s. To get the students involved, I then asked them, “What is Yoga?” (My teacher warned me ahead of time, thankfully, that this was an awfully quiet group.) There were about 15-20 students, all female except for one male, and everyone was silent. Some students were listening intently while others gazed off in space… it was Monday morning, and I was as enthusiastic as a Friday! “It was relaxing,” one person said. I briefly went over some Sanskrit terms such as Yoga, Raja Yoga, Hatha Yoga, and Asana; what their meanings are, how their concepts relate to one another and what we were about to do that day. Following the slide presentation, we moved to another room for our practice. The room was one I rarely visited during high school as it was primarily for the drama students. It was called “The dungeon.” What a perfect name for the environment in which I would be offering yoga! My teacher and I had a good laugh. Teens can lose interest quickly so I had to keep them engaged. As the students walked in, (some had changed out of their jeans), I had them spread out and find their spots. We began in Firm Pose, Vajrasana. Because this was a beginner’s class and our time was limited, I decided to leave out the Sanskrit names of the poses and focus on the English names. Our practice would be a blend of both Western and Eastern teachings. Simply explained to these teens, I told them we would use yoga mats (which some sadhus in India may never have even heard of), and we would also take the time to go within ourselves and explore our inner universe. Only having one chance to offer Ananda Yoga to these students, I decided to incorporate both energy awareness and relaxation throughout the routine. We sat on our heels, crossing our right big toe over our left. I had the students sit up tall and relax their shoulders. I invited them to bring their palms together in front of their hearts in prayer position. The students smiled as they said ‘Namaste’ to each other. It was a very sweet way to begin the class and set the energy. It helped the students to become quiet, inward, and present in their heart centers. It also gave them a sense of sacredness. Yoga isn’t just physical, after all, it is spiritual. This is definitely true. I tied in the benefits of breathing deep in the belly to reduce stress, calm the mind, and induce muscular relaxation. I encouraged the students to breathe in this way throughout the poses, especially if they came up against tension in the body or resistance in the mind. We spent a good 10 minutes on warm-ups. Simple exercises that synchronize breath and movement are great for beginners to learn how to connect with their bodies before the asanas. We practiced the Happy Baby Pose as a hip-opening warm-up and it created some good laughs. Laughter helps people of any age to relax. Yoga practice shouldn’t become so serious that one can’t even smile or have fun! Though yoga can be serious at times, letting your class progressively move into that focused experience over time is important. Looking around the room, I saw some very focused students inwardly taking in the experience. For the most part, however, these teens were new to connecting with their bodies in this way, and adding the presence of other classmates created some awkwardness at first. Surprisingly, the one male in the class wasn’t embarrassed at all. He did great! Over time, the more we exchanged energy in class, the more the students began to relax both physically and mentally, which helped them feel safe and supported. During the asanas, I noticed the students really enjoyed it when I demonstrated a pose ahead of time before guiding them through it. They were new to almost all of the poses, but it surprised me that they were willing to watch my entire demo before moving. Many adults I’ve taught will rush ahead before I can complete a demo. Fortunately, beginners often have the willingness to watch and listen. This group needed to start with the basics, and so I chose simple poses for this particular group, much different from the poses I gave the dance majors (see Part 1 of this article). I tested the waters with different poses to see how well students followed my instructions and how well their bodies moved. Most importantly, each student in the room needed to succeed. I came around the room to adjust people, and surprisingly they were very receptive. I think they enjoyed the one-on-one attention in the poses. Some students think of an adjustment as a sign that they did something wrong, but these students didn’t. We finally ended our class with a long deep relaxation in Savasana. The lights were turned off and the group was quiet. We had created an energy together for the last hour and a half, which felt like a special experience. We closed our class pushing gently back up into Firm Pose. The room was still dark and people were more quiet and inward. I guided the students into a simple meditation experience to achieve peace. We practiced a few rounds of Measured Breathing: inhale for four counts, hold the breath for four counts, and exhale for four counts. We did this a few times and then released the control of the breath and simply watched the breath flow in and out at its own pace—as if watching someone else breathe. We added in a silent affirmation: “I am”, on the inhalation, “Peace” on the exhalation. The lights turned up and the students and our teacher thanked me for the class. I handed out little Namaste cards as the students walked out. They were happy to receive this gift as they left, and many of them smiled at me with kindness and a sense of lightness about them. The bell rang, and they were off to their next class. Even though they were a quiet group, I could feel that they left with inner joy. And that’s what it’s all about. This entry was posted in Yoga Teacher Training and tagged Inspiration for Your Yoga Teaching, Unique Yoga Teaching Experiences, yoga, yoga for teens. Bookmark the permalink. Great article Melody.I love the depth you go into,describing how you set up your class.Many thanks. Thanks Barry! Great to hear from you. Many blessings on your teaching too! Thank you for such a great article!It was very helpful to me as I want to work with women to connect with their inner Goddess (higher self), specifically young women.I love the slides you included. I especially enjoyed seeing your Namaste card…may I copy that image to use for my class handouts? You’re welcome! I’m so glad you enjoyed reading this. The Namaste card I received from a google image search. I’m sure it’s fine to use as I have.